One of our most recent speakers in the Social Change Career Series, Erich Pica, is the President of Friends of the Earth. He has a long career as a lobbyist and activist for the environment and works on policy development. His career series session offers some fascinating thoughts about the importance of today’s political climate; how this climate inevitably impacts the work that social workers and policy developers do; and finally, what skills and some advice to manage and be successful in this rapidly changing climate. Be adaptable – Take risks! I took two major takeaways from Erich Pica’s career series. The first was the discussion around the challenge of sticking to your mission, while also being adaptable and comfortable with evolving. This is necessary for organizations to stay alive and relevant. The second is to remember that no one knows the answers to issues that we as social workers are trying to resolve; therefore be humble, collaborate with others, and take risks. This advice can also be applied when thinking about our job search. We may know our mission, the overall goal that we want to achieve, but, it’s possible that the exact position that you are looking for is not available- maybe you don’t even know what it is yourself, yet. Erich’s experience of being a general intern at Friends of the Earth allowed him to learn the ins and outs of the organization, and eventually led him to being the director. As job searchers, we need to find an organization or cause that we believe in, that aligns with our personal values and missions, and if we can be adaptable in the roles that we play within the growth of that organization, we will be successful. One great way to get involved in this type of work is by researching organizations that already exist that you are inspired by. Learn everything you can about them; discover what what they are doing and why they have survived. What specific projects are they working on that you could see yourself getting involved in? Luckily, today’s world of social media and the world wide web gives you direct access to all the information you need. Once you are inspired, reach out to people in the organization (Try LinkedIn)! A friend who was also on the job search typed up a short, general note that she sent out to about 40 people she found on LinkedIn who worked in organizations that interested her. This note explained a bit about herself, and more importantly asked to learn more about their experience and position. Her “no shame” approach got her about 4 coffee dates and a few interviews. One person who she reached out to at an organization she had applied for gave her feedback; they stated how she “stood out from the other 400 applications”, and they may have overlooked her otherwise. Just like Erich Pica advised, TAKE RISKS! Finally, try and volunteer. Is there any organization you can get involved in on the weekends? Yes, we are busy, but even just once a month might be enough to make amazing connections and “get your feet wet”. 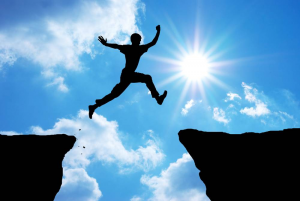 What are some ways you are taking risks in your job search? Share your ideas in the comments section below. If you haven’t had a chance to watch Erich Pica’s entire Career Series Session I encourage you to take a peek. I have no doubt you will be equally inspired by his journey.